So what can you do to develop your little one’s sense of humor? Make funny faces and sounds: This type of visual humor can elicit laughter and smiles in your baby. Since babies sense your joy, they are likely to imitate you. Tickle their bodies or blow raspberries on their bellies: Babies are also very responsive to physical stimulations which can definitely make them laugh. Get silly and playful: Unexpected situations like placing your baby’s diaper on a teddy bear’s head can be very funny. Between 9-15 months of age your little one begins to understand this and it may elicit some chuckling. Play peek-a-boo: At around one year of age Peek-a-boo becomes a very exciting game. When your little one cracks up during this game you can tell his intellectual development is flourishing. Babies’ come to realize that when mommy or daddy hides they will come right back, but it is still a tense situation. Now, when they reappear the tension is released in the form of laughter and the situation becomes a fun game. Ignore the obvious: Pretend you can’t find an object that is in plain sight or mix up objects such as a spoon and a fork. “I will eat my ice cream with this fork” and have it fall back into the plate before it reaches your mouth. 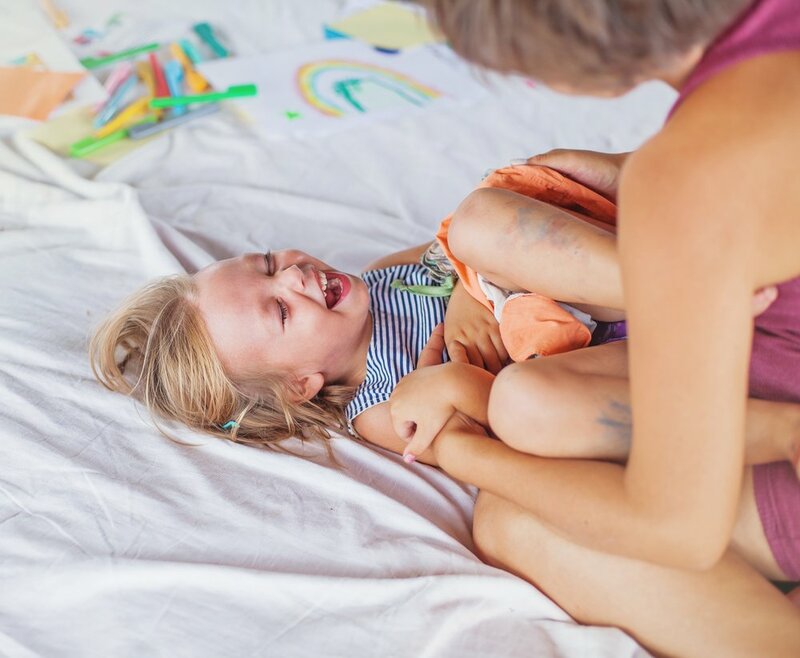 Continue making funny sounds and faces: Invite your little one to make his own, and also dance to the rhythm of your sounds. Make inanimate objects talk: For example, have your toddler’s sandwich talk or his pajamas tell a story. Play chase, tickle, kiss: Chasing games are a great way to crack your little one up. Plus, it is a great way to bond and get active. Dress up in a goofy manner: Visual humor is very entertaining to toddlers. Wearing a silly hat, clothing, or shoes on your hands is a great way to evoke laughter. Remember that you do not need to be a natural comedian to foster your baby’s sense of humor. It is very easy, all you need to do is be open to playful situations and laugh at yourself. Don’t be afraid to be silly; modeling humor is the best way to teach your little one about it. Then, with time, you can create funny traditions and continue fostering a humor rich environment right at home.